I’m currently in research mode looking into the next step towards energy independence. For the next investment (actually reinvestment, of savings from previous investments, particularly the electric car), I’m weighing up Battery Storage or a Heat Pump. Each have their merits. Battery storage provides a way to store excess Solar PV in summer, and to store cheap night rate electricity (€0.05 / kWh) in winter to remove daytime electricity costs (€0.19 / kWh) – like PV, prices are falling rapidly, though it is still probably on the expensive side. A heat pump would allow us to heat the house fully with electricity, meaning we can generate it ourselves at a fixed price per kWh no matter what gas / oil markets do, remove our gas connection and it’s costs completely, and obviously remove our gas bills. Assuming installation costs of: Gas (€2000), Oil (€3500), Heat Pump (€4000) and Heat Pump plus PV (€7000), coupled with their yearly running costs above for 15 years gives the chart above. Heat pumps certainly come out cheapest. A heat pump will be cheapest of all if you already Solar PV installed, as some of the heating can be done with excess PV generation. If you don’t already have PV installed, then it wouldn’t make sense to install PV just to run a heat pump, it would be cheaper to bring in all of your heating needs with a heat pump during cheaper night rate electricity. The installation costs are rough estimates – I haven’t installed these before so I’m not sure. But you could re-do the chart above yourself based on your own installation costs and heating requirements to figure out what is cheapest over the 15 years. Oil and gas prices taken from here. Day / Night rate prices taken from what I’m currently paying. How is a Heat Pump More than 100% Efficient? Wait, in the figures above, the heat pump is 300% efficient. How can that be? 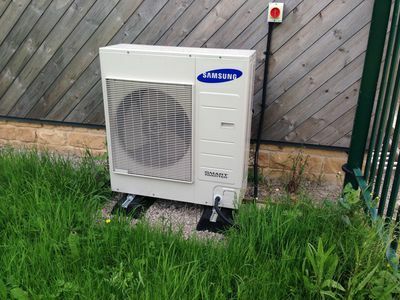 A rather amazing thing about a heat pump is that they are often more than 100% efficient. For every 1 watt of electrical energy used to run them, they can pull in 3 or 4 watts of heat energy into your house. No, they do not violate the laws of thermodynamics. They do not “create” energy, they “move” energy. They move it from one medium (heatpumps use air, brine, water) with “low” temperature to an other medium (or the same) with “higher” temperature. This is pretty compelling, particularly when you can quite easily generate your own electricity with Solar PV – they provide a path to generating all of your own heating and electricity at very low costs. 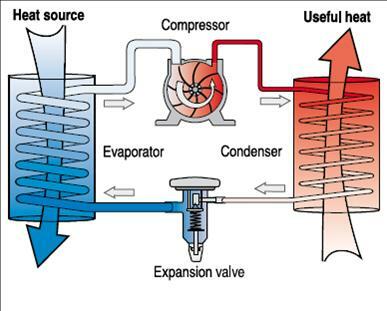 Dig more into heat pumps here. The Heat Pump in the figures above is 300% efficient, so it takes 19,898kWh of heat energy demand / 3 = 6,632 kWh of electricity to pump in 19,898kWh to the house. So a first analysis of heating types all up? Heat pump looks like the way to go.